Welcome to Cooking with Grace! This is where Grace Singleton, a managing partner at the Deli, shares her favorite products and delectable home cooking tips with us. This week, she’s using one of the five new Parmigiano Reggiano varieties that the Deli is now carrying in this delicious pasta dish. One of the challenges with all this great cheese is that I can’t choose which one I like best, so I currently have three different Parmigiano Reggiano varieties in my fridge. Not a bad thing, but my cheese drawer is petty full (although I seem to be eating it as fast as I bring it home)! 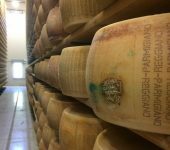 There are plenty of different ways to enjoy Parmigiano Reggiano, but the first thing most people think of using Parmigiano Reggiano on pasta. One of the things I love about pasta is that it’s fairly simple to make a great tasting dinner with just a few really tasty ingredients. Also, with the cooler weather this time of year, walking into a nice steamy kitchen where I’ve been boiling pasta feels warm and homey. Now I generally don’t plan my meals out too far ahead. I like to look in my fridge and garden to see what I have on hand, or after a day of work, I’ll walk around the Deli retail area to see what inspires me or makes my mouth water. Recently, I was hungry and not in the mood to do anything too time consuming but also wanted to use some of the Parmigiano Reggiano I had in my fridge, so I decided on a two meat pasta recipe that features the Roncadella Parmigiano Reggiano. 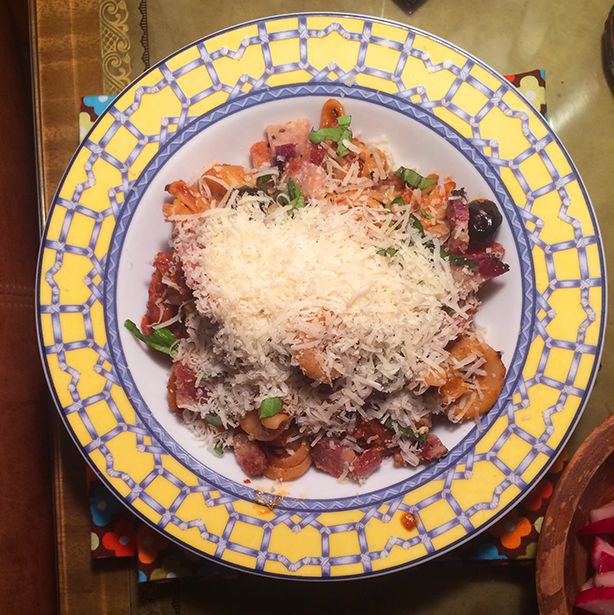 You can substitute different ingredients and flavor combinations, as that’s the fun part about cooking, but I was really fond of the depth of flavor that occurred when I combined the pancetta, the soppressata salami, dry-cured beldi olives, and the cheese. An insider trick I learned from the talented women cooks we got to visit while we were in Italy was that in addition to serving Parmigiano Reggiano at the table on top of pasta, they also add the grated cheese into their pasta sauce as it is finishing on the stove. The freshly grated Parmigiano Reggiano adds some saltiness, but also can thicken the sauce and adds its own distinct flavor profile to it. One of the unique characteristics of Parmigiano Reggiano is that it can melt into a sauce differently than other styles of cheese. The italians rate Parmigiano Reggiano on its friability (how it breaks into very small pieces), and it’s solubility (how it melts), and instead of the stringy stretchy elasticity that I think of when melting a gruyere or provolone cheese, Parmigiano Reggiano will dissolve into the sauce which makes it an ideal ingredient in pasta sauces, or other dishes in addition to being a tasty topping. 2 cups plain tomato sauce. 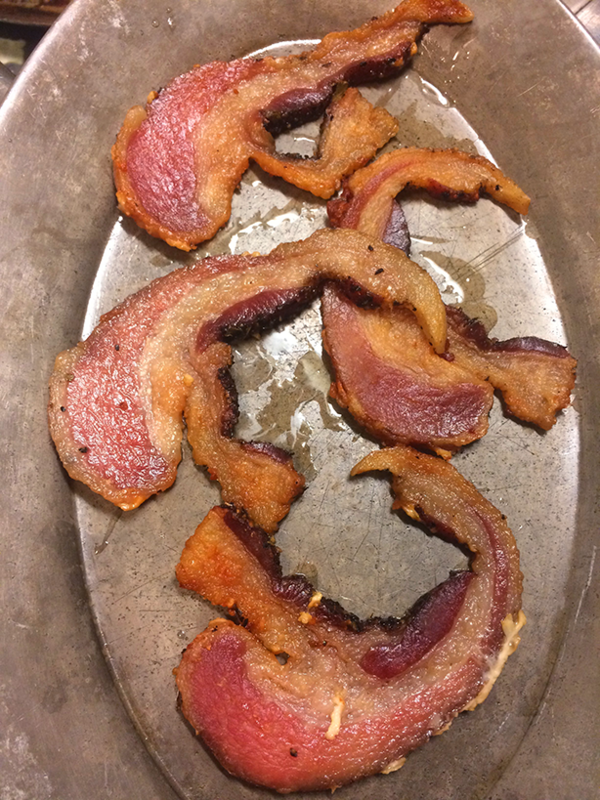 Using a large sautée pan, cook the pancetta over medium heat, until lightly browned on both sides and as crisp as you prefer it. I like to cook it through slowly until it’s medium brown on both sides, so it will be crumbly and crispy as a garnish on the pasta when it’s served. Add the onions to the pan and cook until translucent. 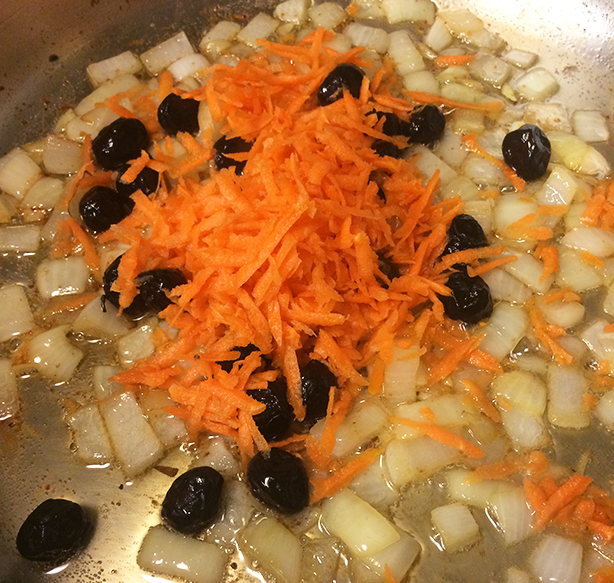 Add the olives and carrots and cook a few minutes until the olives are warm and the carrots are tender, but still in tact, not soft. Add the tomato sauce and cook until the sauce is warmed through and at the consistency that you like. If you prefer a very thick tomato sauce, you can reduce it down longer to remove more of the water. 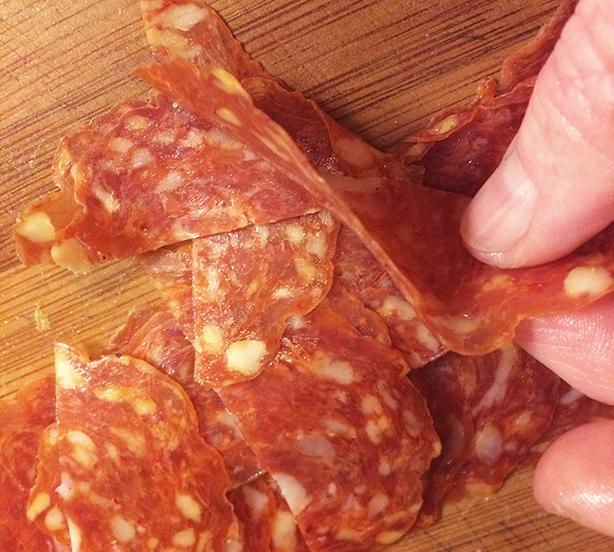 When the sauce is at the thickness you like, add the salami and ½ cup of grated Parmigiano Reggiano. Taste the sauce and add more salt or pepper to taste. While your sauce is cooking, bring heavily salted water (it should taste like the sea) to a boil and cook according to package directions. 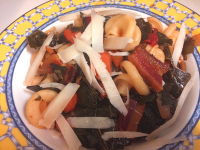 Before you drain the pasta, save and set aside 1 cup of the cooking liquid. Add the drained pasta to the tomato sauce in the pan, adding ¼-½ cup of the reserved pasta water, and cook for a few minutes to incorporate the flavor of the sauce into the pasta. Serve freshly grated Parmigiano Reggiano cheese, the cooked chopped pancetta, and fresh basil on the side that each person can use to garnish their plates as they like. *a note on the olives- I like using whole olives that still have the pit in them. 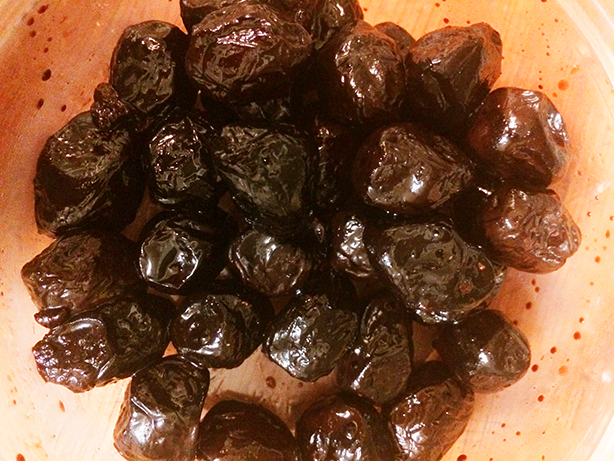 I find the texture of the olives, and the flavor are much better than the same brand and variety of olives that have been pitted. When I was in Italy, all of the olives that were used in recipes (baked in breads, used in salads, etc.) all contained pits. It’s just what they are used to—they expect olives to have pits. 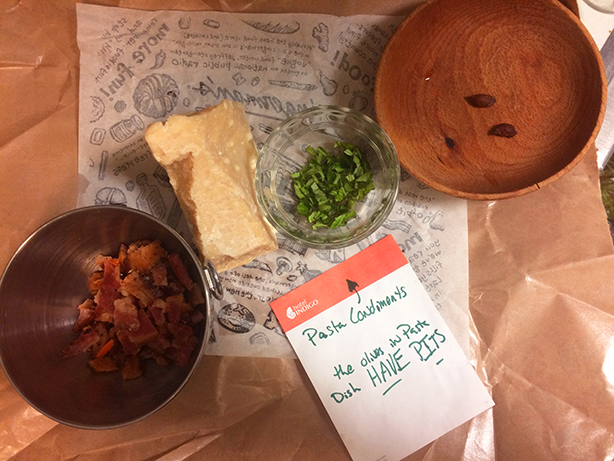 Here in the U.S., we’ve often made culinary choices that favor convenience over flavor, and most people would find an olive pit an unexpected and unwelcome visitor in a pasta dish. I actually think it helps me to follow my own commitment to eating more slowly and really savoring the food that I eat. I have to focus a bit more on what I am putting in my mouth, and eat a little more slowly, but the payoff is that I feel more satisfied after the meal. I’d make sure to warn your guests that there are pits in the olives. **A note about freshly grated Parmigiano Reggiano. Fresh grated cheese is better, and it doesn’t have to be a chore. The pasta grater that I show in the photos is one of the graters that I discovered at the retail shop for Roncadella. The Consorzio Parmigiano Reggiano supplies these, and Marissa the cheese maker from Roncadella, gave us one along with some cheese samples when we visited. Because of that, I requested they ship us some to sell at the Deli. I love this grater and find it easier to use than a traditional four-sided box grater, or the newer style micro planes. 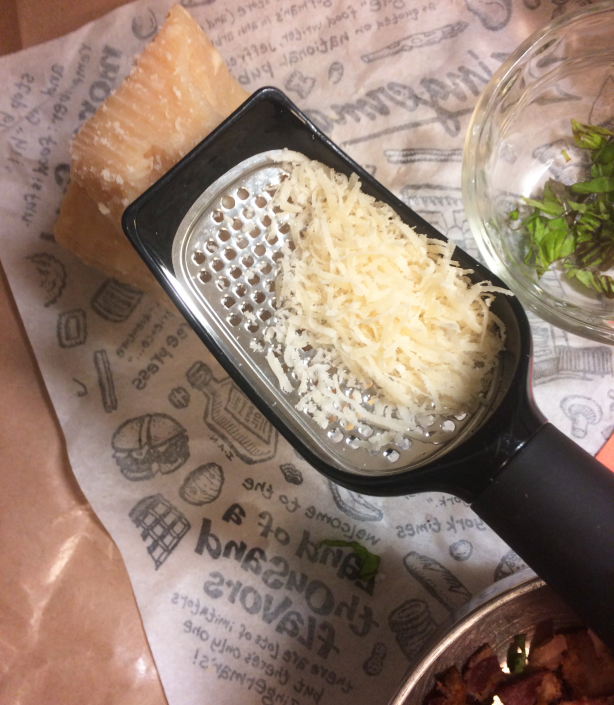 The handle is large enough and long enough to grasp easily, and it makes grating fresh Parmigiano Reggiano simple and easy, plus it’s easy to clean. You can just bring the grater and a hunk of cheese to the dinner table on a plate and pass it around. No time spent in the kitchen grating cheese, and no left-over pre-grated cheese, because you overestimated or running back to the kitchen because you underestimated! The design of the grater allows it to hold the cheese as you grate it. You can grate almost a ¼ cup of cheese into this grater at one time and then sprinkle it over anything and everything—pasta, soups, salads. 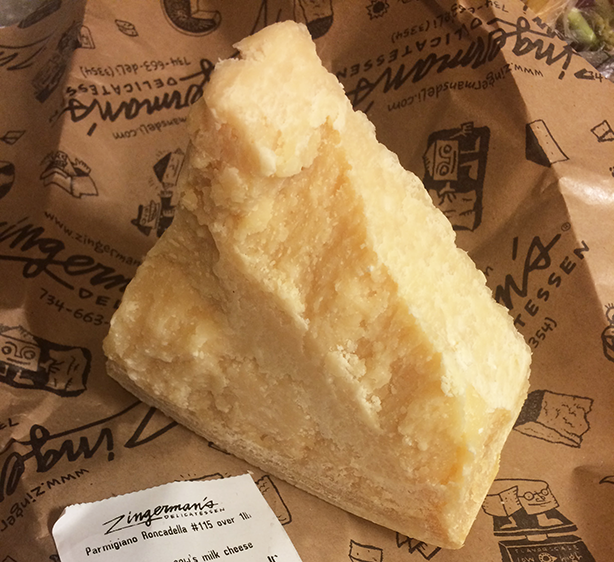 You may end up with a hunk of Parmigiano Reggiano on your table at every meal! 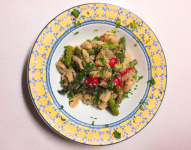 Cooking with Grace: Make Pasta Primavera Like a Pro!